DESIS acquires image data on 235 closely spaced channels from the visual to the infrared spectrum (between 400 and 1000 nanometers). The DESIS (DLR Earth Sensing Imaging System Spectrometer) environmental and resource monitoring system will send a wide range of data to Earth. The DLR Earth Sensing Imaging Spectrometer (DESIS) – an environmental and resource monitoring system from the German Aerospace Center (Deutsches Zentrum für Luft- und Raumfahrt; DLR) – set off for the International Space Station (ISS) at 05:42 EDT (11:42 CEST) on 29 June 2018. The Dragon capsule carrying DESIS launched from Cape Canaveral Air Force Station on a SpaceX Falcon 9 rocket. 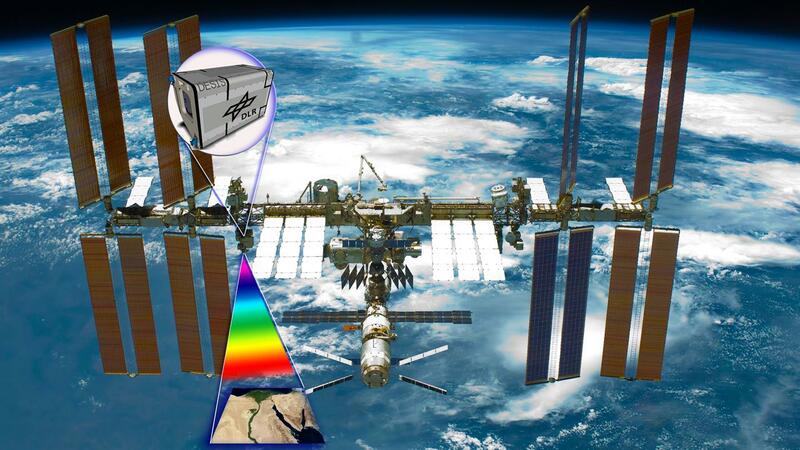 The hyperspectral instrument was developed by the DLR Institute of Optical Sensor Systems in cooperation with the US company Teledyne Brown Engineering (TBE) in order to monitor the environment and resources on Earth..
After arriving at the ISS, the instrument will be unpacked and prepared for use on the Multiple User System for Earth Sensing (MUSES) platform developed by TBE. This platform can accommodate up to four Earth observation instruments. DESIS will be moved into space through the airlock of the Japanese Experiment Module (JEM). It will then be installed on the MUSES platform using the Canadian robot arm CANADARM2. Installation will take one day, and will be followed by commissioning, which includes a system check and a pointing calibration test for sites on Earth. DESIS is a hyperspectral sensor system with 235 closely spaced channels that are able to record image data from the visible and near-infrared regions of the spectrum (between 400 and 1000 nanometres). It has a surface resolution of 30 metres from the ISS orbit at an altitude of 400 kilometres. This data reveals changes in the ecosystems on Earth's surface. Scientists can use the information acquired in this way to assess the condition of forests or farmlands and forecast their yield. Another purpose of DESIS is to secure and improve global food production. 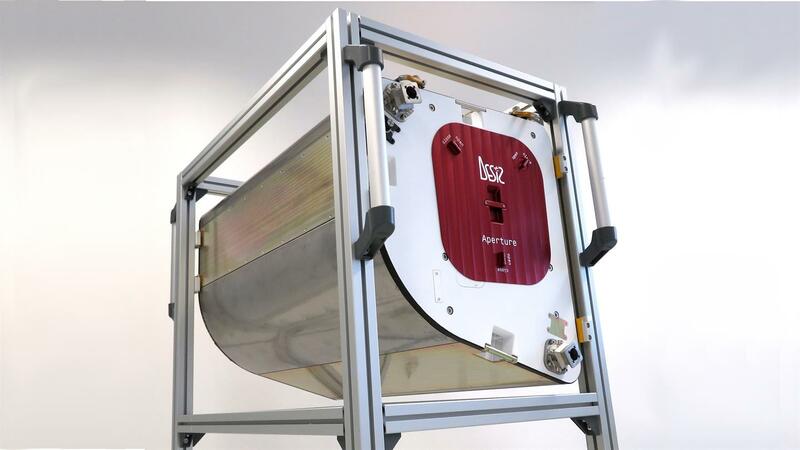 Once DESIS is installed, DLR will become the first user of MUSES, which was positioned on board the ISS in 2017, transforming the space station into a universal instrument platform. From their position on the ISS, DESIS and MUSES can point forwards, backwards and to the sides, allowing the instrument to respond with outstanding agility. This enables an excellent degree of flexibility in response to environmental disasters or humanitarian crises through the rapid supply of information to emergency services. Based on the mission design, DESIS can be brought back to Earth after a service life of five to eight years, which will allow scientists to analyse the effects of the space environment on remote sensing instruments. DLR and TBE plan to combine the data from future MUSES instruments to continue improving Earth observation in general and hyperspectral sensor systems in particular. Collaboration within this scientific and commercial framework will contribute to hyperspectral remote sensing technologies for future satellite missions as well. DESIS is designed to provide hyperspectral data to support scientific, humanitarian and commercial goals. This data will enable assessment of the situation after environmental disasters, assist farmers in the targeted management of their land, and serve scientists as a basis for the development of novel atmospheric correction algorithms. Hyperspectral data from DESIS will enable DLR to develop new Earth observation applications, for example for resource exploration or precision farming. Humanitarian aid applications can also be improved with DESIS data. DESIS will also enable the further development of hyperspectral applications and technologies. The new research opportunities relate to monitoring the global ecosystem, resource monitoring and exploration, and improving response to humanitarian crises.